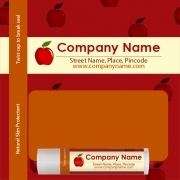 Custom caramel apple flavored lip balm encompasses richness of apple and caramel flavors to form a feisty lip dab. It is empowered with brilliance of fruity poise (apple) and dessert charm (caramel sauce), which combinely makes it a sweet and witty lip balm with a purpose. It is formulated using natural emoluments and vitamins such as E, which helps to hydrate lips, and soothes tissues in lips. It leaves a lustrous finish, and adds sheer brilliance to the pouts, which are often absent from face due to harsh weather conditions.